For a while now I've wanted to step up my blogging game. I wanted to get rid of the sporadic posting times and figure out a schedule that I could stick to, but one that will still leave room for flexibility. Not only did I want to become more organised when it came to blogging, but I wanted to start tracking my numbers. I know many people don't like tracking their numbers, but to see my page views, followers and social media numbers increase motivates and inspires me as I can see my blog growing. After dabbling with the idea of starting Bullet Journal, but figuring I'm not the most patient person in the world, I knew I wanted a journal/diary that was already set up for me. 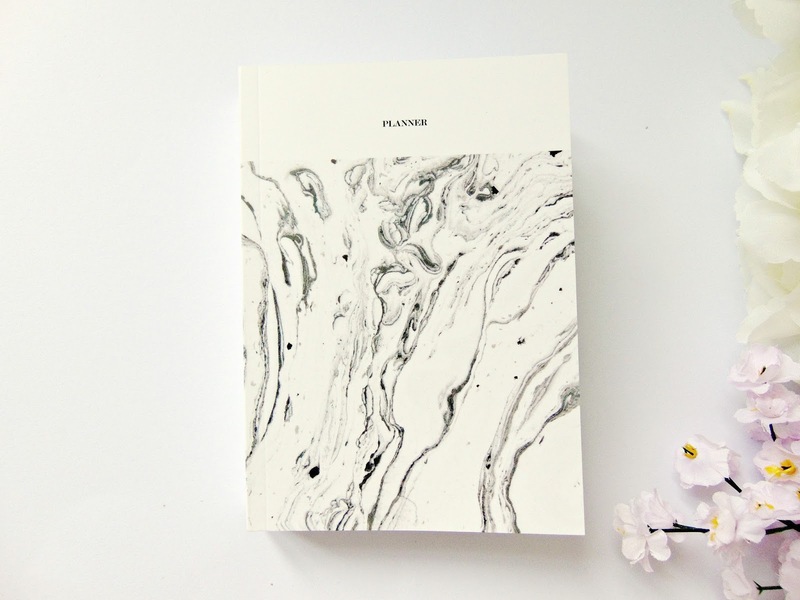 Introducing the Blogger Planner by Da Silva London. There's many planners to choose from on the website, but I went for the old cliche of the Limited Edition Marble Blogger Planner. Yes, I am original. This planner has everything you could possibly want when trying to organise your blog. Here's a sneak peek of a few of the pages. At the beginning of the planner there's lots of sections you can fill in. One of my favourite sections is the goals, here I've written down everything I want to achieve in the next year. Even though this is a blogging planner, I will be using it for every day life too, therefore I've written down general day to day goals as well as blogging goals and when I'd like to achieve them by. The front part of the planner also includes a section to write down exciting events coming up in the next year e.g. birthdays, concerts, blogging events as well as a section to write down twitter chats! This bit is super helpful, I have to Google twitter chat schedule's almost every day of my life, so it's great that they're all in one place. Each month contains standard diary entry. At the end of each week you can write down you finances and track your outgoings, incoming and what you have saved that particularly week. After each week, there is a place to keep track of your content. As you can see, you can write down the title, basic outline of the post and when the post is going up. My favourite part of the content spread is the checklist! I don't know about you, but I can forget how far along I am with posts as I'm sometimes putting a couples of posts together at the same time, therefore this part allows me to keep track of what posts are scheduled, which are drafted, but need editing and all my social media postings. At the end of each month, there's a section to write down your favourites of that month and your recent hauls, which I think is a fab feature for all those beauty and fashion bloggers out there! How many of us struggle to think of beauty favourites at the end of the month for blog post or video?! This is so handy to jot notes and write favourites down as the month goes on. Along with favourites and a haul section, it also has a stats section which is exactly what I wanted in a planner. It easily lets me track my numbers and see where and how I'm growing. Although I love the planner, it took around 5 weeks to arrive which is a lot longer than I would have liked to have wait, so be prepared if you order this. If I had the chance to order again I would also order the bigger size. The planner I ordered is A6 and although it is perfect to carry around with me, I would like it to be a little bit bigger so I have more space to write ideas and my tasks to do down. This planner is absolutely perfect for bloggers! Like I've mentioned if you haven't got the patience for a bullet journal or want a planner specifically for blogging, then this is a must have! The Marble Edition seems to be no longer available, however you can still purchase the regular Bloggers Planner for £22.